Yup. We hit another Chicago area Diner’s, Drive-In’s, and Dive’s place. J and I are back in Chicago for another weekend trip. We have tickets to a show in Hammond, IN tonight which isn’t far from her parents house. Her mom and step-dad had a prior commitment during the day, so J and I were on our own for lunch. I had been wanting to check out another place we saw on Triple D that was only about 20 minutes from her parents. After they left for the morning, J and I got going and headed to Willowbrook for lunch. 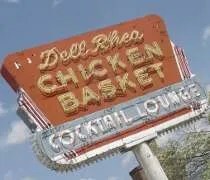 Dell Rhea’s Chicken Basket has been on Joliet Road in Willowbrook for almost 70 years. Of course, in the early days, Joliet Road was Route 66. A lot has changed since then. Interstate 55 is in Dell Rhea’s backyard and the old Mother Road is hidden behind an office park. In fact, J is very familiar with this area. Her high school speech team used to stay at a Holiday Inn down the road and her grandma was in an area nursing home for a few years yet she had never seen our destination. I almost beat Guy Fieri to a restaurant instead of going after I see it on Diner’s, Drive In’s, and Dive’s. If you watched Triple D last night, you saw a pizza joint on Chicago’s south side called Vito & Nick’s. 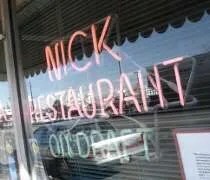 When J and I were home for Thanksgiving, Vito & Nick’s was one of the places J’s step-dad suggested. We chose BBQ instead and went to The Pit Rib House (review HERE) in Hickory Hills. Now, when we go home in February, we’ll follow Guy again and go check out Vito & Nick’s…. Guy Fieri let me down. That’s painful to say out loud. 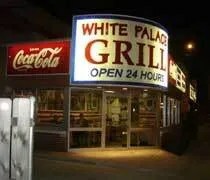 My girlfriend and I first heard of the White Palace Grill in downtown Chicago on an episode of Diner’s Drive-In’s and Dives about 24 hour diners. I was working in Chicago this past weekend and since my girlfriend’s parents live in a Chicago suburb, she decided to come with me and take a long weekend. We left Lansing around midnight on a Thursday night and got to Chicago a little after two a.m. We took a detour into the city instead of just heading to her parents. We’ve been to a handful of places featured on Triple D including two others in Chicago and figured if Guy went there, it must be good. We were wrong. Really, really wrong. Posting is going to be light again this weekend. I’m heading to Chicago Friday to shoot the Barclay’s Churchill Cup rugby at Toyota Park in Bridgeview on Saturday. My girlfriend took the day off so we can make a long weekend out of it and get to spend some time with our parents.